We’d love your help. Let us know what’s wrong with this preview of Telephone Ringing in the Labyrinth by Adrienne Rich. To ask other readers questions about Telephone Ringing in the Labyrinth, please sign up. So good. It's the second-to-last collection she ever published, and it's up there with her best. As Rich entered her 70s, she began looking back in a different way than she'd previously done. You could look at the book as a long conversation with/meditation on the ghosts/legacy of the Sixties and Seventies. In "Skeleton Key," she ends a section that begins "Cut me a skeleton key/ to that other time, that city/ talk starting up, deals and poetry," with an acknowledgement that she is "Exhuming the dead / Their questions." She circles back repeatedly to the sense that that era was, in fundamen As Rich entered her 70s, she began looking back in a different way than she'd previously done. You could look at the book as a long conversation with/meditation on the ghosts/legacy of the Sixties and Seventies. In "Skeleton Key," she ends a section that begins "Cut me a skeleton key/ to that other time, that city/ talk starting up, deals and poetry," with an acknowledgement that she is "Exhuming the dead / Their questions." She circles back repeatedly to the sense that that era was, in fundamental ways, different than what was to follow: "But as for living at that time/ we were all living together with many others/ for whom living was precisely the question" ("Even Then Maybe"). Among those others, the Leroi Jones of The Dead Lecturer (not to be confused with the Amiri Baraka of Black Art),who she addressees directly in "Rereading The Dead Lecturer," which balances on the knife edge between regret and affirmation of "An idea. And we felt it./ A meaning. And we caught it/ as the dimensions spread," conversations "scrawled with smoke and music." Whatever his contradictions and limits, Jones wrote, as Rich concludes the poem a "(book of a soul contending." All of that against the backdrop of the Bush era with it's "Excruciating contempt for love/ For the strained fibre of common affection, mutual assistance" ("Draft #2006"). Like the smoke and music--I can't help thinking of Paul Simon's "the words of the prophets are written on the subway walls and tenement halls"--Rich listens for "Contraband packets, hummed messages. Dreams of the/ descendants, surfacing." At several key points, wearily but with a sense of surprised wonder, she turns her eyes to the cosmos. In "Hubble Photographs: After Sappho," she turns to "the ex-stasis of galaxies/ so out from us there's no vocabulary/ but mathematics and optics/ equestions letting sight pierce through time/..."beyond good and evil as ever stained into dream/ beyonw remorse, disilluison/ fear of death." It's not somewhere she can or would rest or remain. Rather, as she has done again and again for more than four decades, she recommits herself to the poet's work, seeking to forge an "instrument searching, probing/ toward a foreign tongue" ("Long After Stevens"). It matters because without clear honest articulation, the descendants will find themselves lost: "You think you are helpless because you are empty-handed/ of concepts that could become your strength" ("Letters Censored Shredded Returned to Sender or Judged Unfit to Send"). Feeling age, knowing death isn't abstract, she turns to the task "Not for me/ but for furtherance," for the descendant, "You, the person, you/ the particle fierce and furthering." I felt like I just couldn't "get into" this collection at first. --In other words, I felt too stupid to really understand it. The last couple of sections really drew me in, though, and wouldn't let me stop reading until far too late in the evening. 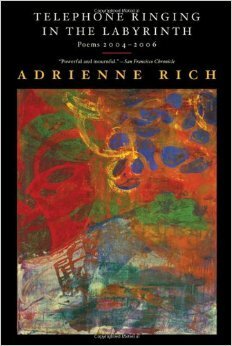 Adrienne Rich's poems are always gorgeous, provocative, and striking. In this collection in particular, though, there's a sort of haunting quality to many of the works. The political element that comes into her poetry so often, and which makes for some of my favorite poems, is turned more toward personal revelation and struggle here, focused more on characters and situations which readers will find strangely available and familiar, less documentary in a larger sense as opposed to a relatable, if Adrienne Rich's poems are always gorgeous, provocative, and striking. In this collection in particular, though, there's a sort of haunting quality to many of the works. The political element that comes into her poetry so often, and which makes for some of my favorite poems, is turned more toward personal revelation and struggle here, focused more on characters and situations which readers will find strangely available and familiar, less documentary in a larger sense as opposed to a relatable, if sometimes terrifying, personal sense. This collection surprised me--it wasn't what I expected, based on other collections of Rich's I've read, and yet it was every inch her lyrical voice and elegantly dangerous, striking work. 3.5 stars. honestly, not my type of poetry, so I don't feel completely comfortable rating this. I could really appreciate these poems, even if they weren't personally my favorite. Rich is clearly immensely talented. There are certainly some fine poems in this book, but either Rich's concerns are not my concerns or her way of expressing her concerns are sufficiently strange to me that I never felt she was speaking to me. Punctuation is needed and important! So difficult to read. A couple of gems, but frustrating overall. Not to my taste, though initially I thought I might like these poems. Except for "Rhythm" and one or two others, this collection seems rambling and very disjointed. I had trouble following the flow of the poems, they didn't make sense to me, nor were they pleasing for the words or rhythm. It almost seemed like the author put too much effort into being "artsy" and clever, rather than letting the words speak for themselves. I just didn't get it or enjoy it. Oh well. Adrienne Rich is a magician when it comes to putting one-syllable words in a long row, each one heavy and full as a silver coin. All lined up, they are like a necklace without the string. While for sound she is a genius, for meaning she veers towards the private. I am left out too much of the time for my taste. I enjoy watching Rich's choices and the directions that her poetry takes --often evolving in response to current events. While this collection is varied in its references and in its resonance for me, it contains some remarkable passages and pieces. I am struck by what Rich has skillfully done without, and by the musical quality of the sparser poems. Kind of a let down. I feel this lacks the depth and beauty of Rich's better works. I was also expecting to see more detailed exploration of some of the great social tragedies we experienced in this era, at least in America (Bush Administration corruption, Hurricane Katrina and the Iraq War for example.) If those topics were addressed in here, I missed it. A little too experimental for my taste. Some good stuff in here (After Sappho, Draft #2006, The University Reopens...) but overall I wasn't knocked out. Perhaps that's attributed to late style, but not quite my cup of tea. This are poems of political/dissident commitment sutured with personal extensions. The modalities are willful, loose physics of texture, time, and transformation. I am itched by the ability to simulate abstract expressionist effects through daubs of wispily connected sensual phrases. The only possible way to comment on a book of poetry is to figure out which poem or poems are my favorite. In this collection, "Letters Censored Shredded Returned to Sender Or Judged Unfit to Send" is that poem, six pages of fragments of ideas that somehow work perfectly together. I enjoyed this collection from Rich. Some of my favorites were "Skeleton key," "Melancholy Piano," okay, nevermind, I liked it all. But I do think my favorite was "Letters..."
Not really my style of poetry and I found myself struggling to connect with it. Rich's writing has a highly unique style. In this particular book, she avoids the traditional conventions of punctuation—a technique commonly utilized by language poets. A melancholy collection, gently sweeps you along. A little too diffuse for my taste. If I had a guide walking me through Rich's references and life I might have gotten into it, but coming in cold it rarely moved me. Adrienne Rich (b. 1929). Born to a middle-class family, Rich was educated by her parents until she entered public school in the fourth grade. She graduated Phi Beta Kappa from Radcliffe College in 1951, the same year her first book of poems, A Change of World, appeared. That volume, chosen by W. H. Auden for the Yale Series of Younger Poets Award, and her next, The Diamond Cutters and Other Poems Adrienne Rich (b. 1929). Born to a middle-class family, Rich was educated by her parents until she entered public school in the fourth grade. She graduated Phi Beta Kappa from Radcliffe College in 1951, the same year her first book of poems, A Change of World, appeared. That volume, chosen by W. H. Auden for the Yale Series of Younger Poets Award, and her next, The Diamond Cutters and Other Poems (1955), earned her a reputation as an elegant, controlled stylist. In the 1960s, however, Rich began a dramatic shift away from her earlier mode as she took up political and feminist themes and stylistic experimentation in such works as Snapshots of a Daughter-in-Law (1963), The Necessities of Life (1966), Leaflets (1969), and The Will to Change (1971). In Diving into the Wreck (1973) and The Dream of a Common Language (1978), she continued to experiment with form and to deal with the experiences and aspirations of women from a feminist perspective. In addition to her poetry, Rich has published many essays on poetry, feminism, motherhood, and lesbianism. Her recent collections include An Atlas of the Difficult World (1991) and Dark Fields of the Republic: Poems 1991-1995 (1995).